“Pharmacare for Everyone” is now a central plank in the NDP platform for the 2018 Ontario provincial election. Dental Care was part of the same policy adopted, but so far is being ignored by Horwath. Still, the gain registered for free medical drugs coverage is major, and it is in large part due to the foundation building work and steady agitation of the Socialist Caucus over the past five years. Moreover, it took a successful floor challenge to the resolutions appeal committee, which tried to bury these linked issues in a long list of motions. 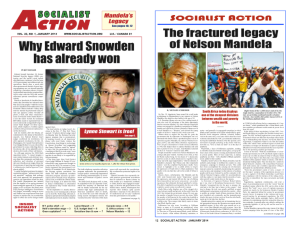 Socialist Caucus members distributed nearly 600 copies of Turn Left magazine, and collected over $245 in donations. And that was quite an achievement, given that this ONDP convention was rather poorly attended. According to the Credentials Committee, only 738 delegates arrived, out of 1059 who “registered,” and 1347 who were eligible to participate. An underwhelming turnout of 54 per cent of those eligible to be delegates should be a source of concern for the party brass.